Every day, headlines surrounding cybersecurity become grimmer, from attacks against power plants to hacks that can disable SUVs, to the loss of personal records in massive data breaches affecting retailers, hospitals, governments, universities and more. Credible entities put the global cost of cyberattacks at $400 billion last year, and predict losses exceeding $2.1 trillion by 2020. Global spending on cybersecurity reflects this growing threat, with the industry expected to grow to more than $170 billion by 2020 from $75 billion today. New Brunswick, as a pioneer in the 1990s and early 2000s in Internet and later broadband Internet adoption, is poised once again to be a global leader in cyber-security. The strong partnership between the University of New Brunswick and IBM helped lay the foundation for the company’s announcement this week that it is growing its workforce in this province. Many may not know that UNB was the birthplace of a cybersecurity technology called QRadar, which today is an integral part of IBM’s global cybersecurity offerings. In the late 1990s, UNB IT staff and students realized a need for better tools to understand and manage an increasingly complex IT environment. Recognizing and meeting this need led to the creation of QRadar and the founding of Q1Labs. UNB continued to support Q1Labs testing, refining and developing the product across the university’s networks. The eventual sale of Q1 to IBM in 2011 still stands as one of New Brunswick’s largest startup success stories. And now IBM is growing cybersecurity workforce and presence in New Brunswick. 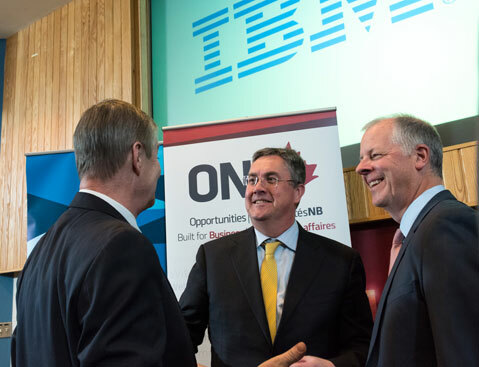 IBM and UNB continue to invest in this highly productive partnership. Our researchers in the faculty of computer science have multi-million dollar collaborative projects with IBM Security with support from the Natural Sciences and Engineering Research Council of Canada (NSERC), work that has resulted in joint patents. UNB is uniquely positioned to support the growth of the cyber-security industry in New Brunswick thanks to talented faculty members such as Dr. Ali Ghorbani, dean of our faculty of computer science and head of the UNB Information Technology Centre of Excellence (ISCX), Dr. Natalia Stakhanova, New Brunswick Innovation Research Chair (NBIRC) in Cybersecurity, and Dr. Ken Kent, now a research professor with the faculty of computer science who heads up the IBM Centre for Advanced Studies - Atlantic at UNB. UNB’s IT department is well known for its use of QRadar and in developing innovative strategies and approaches as we address the cybersecurity threats coming our way. Our director of strategic initiatives, David Shipley, is often asked to speak at events across North America to public- and private-sector groups. Not only do we have a growing group of internationally recognized cybersecurity experts, thanks to our entrepreneurship and innovative expertise through initiatives such as our Technology Management and Entrepreneurship program, we have the ability to take ideas from the lab to global markets. UNB has the potential to lead across several areas of cybersecurity, including the fast-growing area of Internet of Things and the need to protect critical infrastructure thanks to our collaborative partnership with Siemens Canada and NB Power in the Smart Grid Innovation Network. It's worth noting that addressing the cybersecurity challenge will require researchers from the social sciences and humanities in addition to those from science, technology, engineering and mathematics. The most common cyberattacks employ “social engineering” techniques to trick people into giving up information. New research is needed to address the human side of cybersecurity. Today, UNB is positioned to educate the next generation of cybersecurity professionals. Building a cybersecurity workforce will be a tremendous benefit to the province as it seeks to attract more firms to New Brunswick and to support our start-up ventures. Whether through research, through partnerships with cybersecurity firms or through the education of the next generation of cybersecurity professionals, UNB has the people, the ideas, the infrastructure and the desire to help New Brunswick grow this increasingly important global industry. H.E.A. (Eddy) Campbell is president and vice-chancellor of the University of New Brunswick.